Whenever those in power seek to secretly take away the benefits of over 22 million of our citizens they need to be held accountable. A plan so obviously flawed, so heavy weighted with huge tax breaks for the already obscenely rich, is not good for our nation. Such a bill is definitely good in the eyes of the powerful and wealthy elite. But such a bill is morally repugnant, like those who crafted it and are trying to fast-track it through the Senate. Like their greed and their hubris, their shame has no limits. 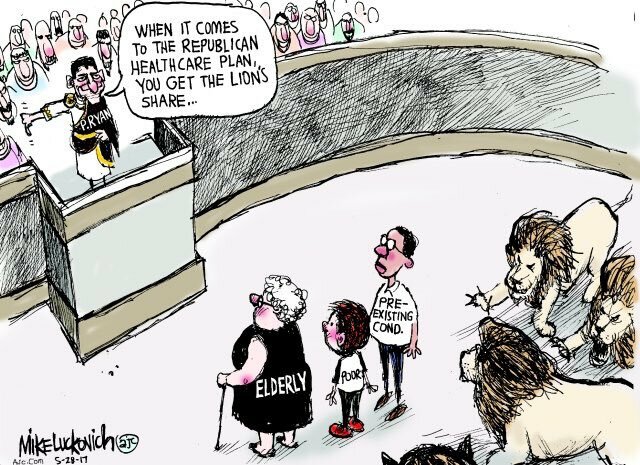 This entry was posted in Hunger & Poverty, News & Views and tagged bill, citizens, elderly, flaws, greed, hubris, Lions, Mike Luckovich, morally repugnant, nation, obscenely rich, Paul Ryan, political cartoon, poor, power, pre-existing conditions, Republican Healthcare Plan, secret, shame, tax breaks, wealthy elite on June 12, 2017 by Ray Buchanan. leadership in the wrong direction? or no leadership? This is a snapshot of what it looks like when our “leaders” are willing to abandon any semblance of representing the majority of us to pass a bill that’s DOA. Their boss, the #BLOTUS, has threatened them and given them orders, and the Koch brothers have promised millions to them if they get in line. Now, we just need to see which of them have the guts to do the right thing. The real leaders will do the right thing for the citizens of our country. The morally bankrupt will quack their way to the bank to see how much they earned for turning their backs on the nation. This entry was posted in Facts & Statistics, News & Views and tagged bank, benefits, bill, BLOTUS, DOA, emergency services, GOP, healthcare, hospitalization, Koch brothers, leadership, maternity care, moral bankruptcy, MSNBC, pediatric care, Pregnancy and newborn care, prescription drugs, rehabilitation, substance abuse treatment, threats on March 24, 2017 by Ray Buchanan.